Well, we've been asked to do some unusual events in our time but this was one of the most unusual! We learnt that there is an annual conference at which learned academics give papers on aspects of The Archers ( a long running Radio 4 soap for those not in the know). 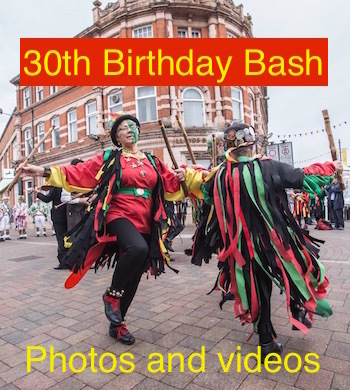 An ex-member, Helen Burrows, was due to speak on The Morris and The Archers and asked us if we could go to the Brutish Library to dance at this event. We rarely decline anything as exciting as this so, after much practicing of a dance to the Archers theme tune, Barwick Green, off we went to London. Helen duly gave her talk for which we were allowed entry to the hall and we then proceeded to give a somewhat chaotic dance performance in the bar among the audience eating their lunch! We were received very warmly and had fun trying to teach a bit of the dance to some of the audience before they returned for the afternoon session. It was an excellent day out and greatly enjoyed by us all.